This article is about Kings Langley in Hertfordshire, England. For the suburb of Sydney, Australia, see Kings Langley, New South Wales. Kings Langley is a historic village and civil parish in Hertfordshire, England, 21 miles (34 km) northwest of central London to the south of the Chiltern Hills and now part of the London commuter belt. The village is divided between two local government districts by the River Gade with the larger western portion in the Borough of Dacorum and smaller part, to the east of the river, in Three Rivers District. Kings Langley High Street, looking north. It was once the location of Kings Langley Palace, a royal palace of the Plantagenet kings of England. The 12th century parish church of All Saints' houses the tomb of Edmund of Langley (1341–1402), the first Duke of York. 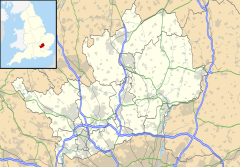 It is 2 miles (3.2 km) south of Hemel Hempstead and 2 miles (3.2 km) north of Watford. The place-name Langley is first attested here in a Saxon charter of circa 1050, where it appears as Langalega. It is spelt Langelai in the Domesday Book of 1086, and is recorded as Langel' Regis in 1254. The name means 'long wood or clearing'. A Roman villa has been excavated just south of the village. The town was probably part of the lands of the Abbey of St. Albans, although actual records have been lost. At the Norman conquest the manor was given to William's half brother Robert, Count of Mortain who let it to one Ralf. It is around the manor that the present village developed as a linear village lying on the old road from London to Berkhamsted and the Midlands of England. In the Domesday Book of 1086, Langley was in the hundred of Danish. Around 1276, the manor was purchased by Queen Eleanor and a palace was built on the hill above the village to its west with a deer park extending to its south. This gave the village its link to royalty, first being renamed Langley Regina after its sponsoring queen, and then later changed to Langley Regis or later still by the added epithet "Kings". The village remained the location of Kings Langley Palace, a royal palace of the Plantagenet kings of England: a Dominican priory was founded next to the palace and remains of this can still be seen. The palace and the grand church that accompanied the priory fell into disrepair at the Dissolution of the Monasteries and little remains above ground level. The Church of All Saints was built during the 14th century on the site of an earlier church. The body of King Richard II was buried here for a time after his probable murder at Pontefract Castle in 1400. It was later removed to Westminster Abbey. The body of Edmund of Langley, died 1402, the fifth son of Edward III and the first Duke of York, still rests in the memorial chapel. The 18th century Sparrows Herne turnpike road (later the A41 trunk road) traversed the Chilterns via the valley of the River Gade and ran down the village high street. The 16th century Saracen's Head public house is a coaching inn which flourished in this period. The Grand Union Canal dating from 1797, and the 1838, London and Birmingham Railway which later became the West Coast Main Line, (the main railway line from London to the north west) pass just east of the village at Kings Langley railway station. 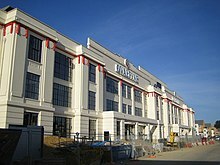 There are many businesses located near the station in Home Park Industrial Estate which is also the site of the Construction and Engineering Centre of West Herts College. 20th century housing developments have led to the village spreading out on either side of the main road. The A41 has now been diverted west of the village leaving the high street to local traffic for the first time in centuries. The surviving building of the former Dominican priory established in 1308 by Edward II, next to the Royal Palace of Kings Langley. During the Second World War, the village was home to the secret headquarters in Britain of the Polish Underground army based at Barnes Lodge just off the Hempstead Road near Rucklers Lane. Kings Langley was the site of the factory making Ovaltine; the listed factory facade is now all that is left and still stands alongside the railway line among a new housing development. The Ovaltine factory itself has been converted into a series of flats and duplexes. The former Ovaltine Egg Farm was converted into energy-efficient offices which house Renewable Energy Systems. The complex incorporates a highly visible 225 kW Vestas V29 wind turbine alongside the M25. Kings Langley School is the local comprehensive school, situated on Love Lane to the west of the village. Kings Langley is also the site of a Waldorf School, the Rudolf Steiner School Kings Langley. This is built on the grounds of the old palace, of which only a small basement part of a pillar remains to be seen. There is a small display cabinet of finds from the palace period in the school entrance foyer. The village became twinned with Achiet-le-Grand in France in November 2009, in honour of Christopher Cox from the village who won a Victoria Cross in fighting near Achiet-le-Grand in the First World War. The M25, the London orbital motorway, passes just south of the village on an imposing viaduct across the River Gade valley. To the north of junction 20 with the A41, a dual-carriageway bypasses Kings Langley and continues to the south of Tring where it flows into the original motorway-standard by-pass. The old route through Kings Langley is now classified the A4251. The Rucklers Lane Community Hall was built for the workers of nearby Shendish Manor in 1909 as a memorial to Arthur Longman, the owner of the estate. Just to the north of Kings Langley is a small village called Rucklers Lane, named after the road it is built on. The origin of the settlement in the early 20th century was the construction of a number of mock tudor houses for the workers on the nearby Shendish Manor estate. A community hall was also built for the workers in 1909 as a memorial to Arthur Longman, the owner of the estate; it was originally intended as a chapel of ease to avoid the long walk to the parish church. Further west along the lane is Phasels Wood Scout Camp and Activity Centre which opened in 1937. Former Ovaltine factory, Kings Langley. This is the listed art deco façade of the former Ovaltine factory. It was redeveloped into housing in 2002. The wind turbine overlooking the former Ovaltine Model Dairy Farm, now the offices of Renewable Energy Systems Ltd.
William Shakespeare's Richard II (1595), Act III, Scene IV, is set in the garden of the palace at Langley. In the 2010 book Beautiful Darkness the character Olivia Durand is from Kings Langley. Kings Langley F.C., as of 2016, currently play in the Premier Division of the Southern Football League. Watford L.F.C., Kings Langley FC is now the home of Watford Ladies who play in FA WSL2. Kings Langley C.C. currently play in Divisions Two, Six, Ten and 14 of the Saracens Hertfordshire Cricket League. Ancestors of U.S. President Jimmy Carter with the Carter surname lived in village 1361-1588. Christopher Augustus Cox VC (1889-1959), soldier decorated for working as a stretcher bearer under heavy fire in France, 1917. Edmund of Langley, 1st Duke of York (1341–1402), the fourth surviving son of King Edward III of England and Philippa of Hainault and the founder of the House of York. Captain Alan Rice-Oxley DFC (1898–1961), RAF officer, First World War fighter ace. Benny Green (1927–1998), saxophonist and radio personality. Bruce Grocott, Baron Grocott, former Labour MP for Telford and current Chancellor of the University of Leicester. Graham Taylor OBE, (1944- 2017), former England football manager and former manager and chairman of Watford F.C. Luke Donald, professional golfer and former world no.1 lived in Kings Langley and attended the Rudolph Steiner School. Steven Finn, current England cricket international. Anthony Joshua, current world International Boxing Federation heavyweight champion attended Kings Langley School. Stuart Slater, former West Ham United footballer. See full reference details below. ^ "Civil Parish population 2011". Neighbourhood Statistics. Office for National Statistics. Retrieved 30 October 2016. ^ a b c Hertfordshire Federation of Women's Institutes (1986). The Hertfordshire Village Book. Ann Roxburgh (Forward). Countryside Books. ISBN 0-905392-71-X. ^ "Power from the wind" (PDF). Renewable Energy Systems. Retrieved 16 November 2008. ^ "French twinning steams ahead". Hemel Hempstead Gazette. 9 April 2009. Retrieved 13 April 2009. ^ Bower, Stanley. "The Fourth John Prime Memorial Lecture: Rucklers Lane Hall". www.kingslangley.org.uk. Kings Langley Local History and Museum Society. Retrieved 26 February 2016. ^ "The Nation: Magnus Carter: Jimmy's Roots". Time. 22 August 1977. Retrieved 16 February 2010. ^ "Christopher Cox VC". www.kingslangley.org.uk. Kings Langley Local History and Museum Society. Retrieved 26 February 2016. Hastie, Scott (1991). Kings Langley, A Hertfordshire Village. David Spain(photographs). Kings Langley: Alpine Press Ltd. ISBN 0-9507647-1-X. Hastie, Scott. A Hertfordshire Valley. David Spain(photographs). Kings Langley: Alpine Press Ltd. ISBN 0-9528631-0-3. Hertfordshire Federation of Women's Institutes; Ann Roxburgh (Forward) (1986). The Hertfordshire Village Book. Countryside Books. Section on Kings Langley. ISBN 0-905392-71-X.